From older stocks of Colombard, Chenin Blanc, Semillon and Pinot Noir. For us, the brandies of Colombard from California have fantastic finesse and show the true potential of California Alambic brandies. However unlike the precocious Pinot Noir, Colombard takes decades to show its full potential. Thus, our XO is blended from brandies that have been in barrel for decades. While by old world standards our stocks are still young, our XO shows the rich development of Rancio with hints of orange peel, dried apricots, walnuts, cacao and a rich leatheriness. Our Apple Brandy is produced from over a dozen varieties of apples all grown in the cool coastal mountains of Northern California. We use everything from the local produced Hauer to a large component of crabapples. Indeed, we began distilling here in Soquel to take advantage of the long apple growing tradition on the Pajaro Valley. While our base cider is more reminiscent of of the ciders from the Basque coast, we use the traditional French distillation and aging techniques of Calvados. Apple is a difficult spirit to tame: it starts life with a fire and vengeance and must be coaxed and cajoled over many years to yield its pomey essence. Indeed, it takes almost a decade in barrel to soften and supple and come forth the apple character so loved on the French Atlantic coast. Our apple brandy has taught us patience, but after 15 years of waiting, we finally released our first bottling in 2010. These brandies of great age and distinction are blended primarily from Colombard and Pinot Noir. 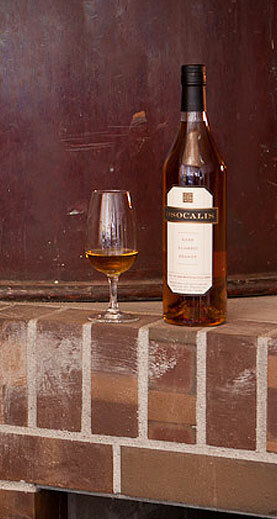 This brandy shows the structure of a mature California Alambic Brandy. 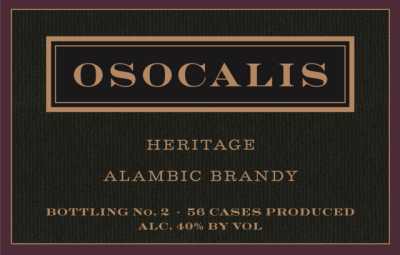 With a deep fruit structure and rich Rancio, the integration of the fruitiness of California Alambic Brandy with the development of the Rancio spiciness make this blend somewhat unique for new world brandies. This blend with hints of clove and cinnamon with cedar, leather, and the dried fruit characters make this blend something to savor.